Hyundai Chairman Chung Mong-koo: "We are taking a fast lane to success and we are not going to stop." This story is from the June print issue of Automotive News Europe. Four print issues are published each year full of news about automakers, suppliers and car retailing. Hyundai Motor Group Chairman Chung Mong-koo has big plans for Europe. The 74-year-old billionaire son of Hyundai's founder, Chung Yu-Jung, wants Hyundai to increase its European sales 15 percent to 465,000 vehicles this year, and sister brand Kia is expected to boost its volume 21 percent to 350,000 this year. In March, Chung visited Europe for the first time to attend the Geneva auto show. At the event, Automotive News Europe Editor-in-Chief Luca Ciferri attended a press briefing with Chung where the chairman answered questions provided by Ciferri as well as other Italian journalists. Volkswagen CEO Martin Winterkorn has said he keeps a close eye on Hyundai. Why should VW be concerned about Hyundai? Hyundai has grown immensely over the last 10 years. Along with putting an emphasis on providing top quality, Hyundai's success factors have been bold investments in product, global r&d centers, production plants, sales networks and early expansion into the BRICs (Brazil, India, China and Russia) and other emerging markets. What does VW have that you're still missing? VW is a fine automaker with high technology and quality and a rich history. However, we will silently go about our business without focusing on one particular competitor. Last year, Hyundai-Kia became the world's fifth-largest automaker by car sales. Do you need a partner to grow further? We will go our 'Hyundai Way' alone. We are not interested in takeovers and mergers. Do you want Hyundai to be the world's No. 1 automaker? We will become the global leader, but this might not be in volume. Through quality growth, we will become the global leader by being the most loved car company. MAIN CHALLENGE Maintaining rapid global growth at Hyundai and sister brand Kia without hurting the company's profit margin that's currently similar to that at premium automakers. CAREER HIGHLIGHTS Appointed chairman of Hyundai Motor Group in 2000. Started at Hyundai in 1977 as CEO of Hyundai Precision & Industry. Moved to Hyundai Pipe in 1981 then to Incheon Iron & Steel in 1986. From 1987 to 1998, Chung was CEO of Hyundai Motor Service. Hyundai-Kia aims to boost global sales 6 percent to about 7 million vehicles this year, but you recently said your growth could have been higher if suppliers can cope. Our priority is quality rather than quantity. Do Chinese competitors worry you? 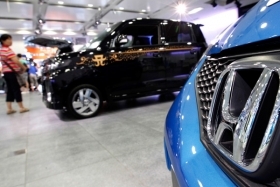 Chinese automakers are experiencing fast progress and growing rapidly. By monitoring the movements of other automakers and the industry, rather than concentrating on a certain competitor, we will build up our competitiveness and our ability to overcome any sort of situation through internal stability. What is your view on world cars vs. localized global products? Hyundai is developing, manufacturing and selling models for customers around the world. Additionally, Hyundai is also manufacturing localized models to satisfy each region's tastes and needs. The i-series of cars for Europe, Russia's Solaris, China's Yuedong and India's EON are the typical examples of Hyundai's localized models. When will we see Hyundai electric vehicles and hybrids in Europe? We are successfully selling the Sonata hybrid in Korea and United States. Next year, we are planning plug-in hybrids and by 2015 pure electric vehicles. We are also well placed in fuel cell technology; however, it is too early to reveal the sale schedule of our eco-friendly vehicles. Hyundai-Kia sales in Europe are growing fast. Do you need more capacity? At this time, we do not have any plans to build an additional plant in Europe. Last year, Hyundai had an operating margin of 10.3 percent, second only to BMW's 11.3 percent. How did you achieve a margin comparable to a premium brand's without having any true premium models? Hyundai's extensive enhancement of quality has lifted the residual value of our vehicles. Thanks to our rising brand value, our products are receiving the recognition they deserve, resulting in lower incentives and discounts. Due to high demand for our products, production and operational fixed costs can be reduced. This is why unit cost per vehicle is sinking. Platform integration is another reason for the unit-cost improvement. The Hyundai and Kia product ranges have a lot of overlap but you succeed in keeping the brands separate in the eyes of consumers. What's the secret? To create synergies, Hyundai and Kia work together in the field of r&d. Otherwise, they are two separate companies with different strategies in all areas including design, marketing, sales and aftersales. Hyundai employees do not think of their work as just a job, they think of each other as members of one big family. We are taking a fast lane to success and we are not going to stop. It is our endless task to motivate the employees through consistent and effective communications for further development. Is there a Hyundai Production System, similar to world-renowned Toyota Production System? Due to the nature of the auto industry, all automakers have a similar manufacturing system. However, our priorities during production are: concentrating in quality; maximizing realization of modularization through [supplier] Hyundai Mobis; maintaining an effective production system by shortening assembly time; minimization of inventory through JIS (just in sequence); and utilizing advanced information and communication systems. Then, the efficiency of the system and operations depends on the ability of each manufacturer. Will Fluidic Sculpture be your worldwide design language and if so will this lead to Hyundai having the same design in all markets? Design philosophy should be consistent. So within Fluidic Sculpture, Hyundai is looking for different designs to satisfy the desire of customers and markets of all the regions of the world.